A $24,000 COBRA Overpayment May Be Lurking! Does Your Company Have These Issues? One employer discovered a past COBRA participant had inadvertently been left on the carrier bill for a full year. Another found a former participant who had been left on the carrier invoice for two years. 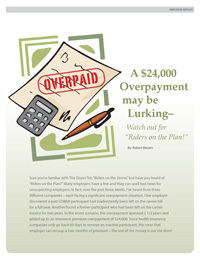 In the worst scenario, the overpayment spanned 2 1/2 years and added up to an insurance premium overpayment of $24,000. Be prepared, not sorry. Get your free report today by completing the form to the right. Request Your Free Report Here!